Everything. The hotel is close to the city center and to the most important things to see in Vienna. The breakfast is ok, you find what to eat if you arent very exigent. The room was clean and the personal was very friendly. It is a good choise is you want a cheap place to stay near the city center. But if you want an luxuriant room, then choose another hotel. The cost of fine. TV was not functioning. The room was pretty filthy. Air-ventilation grids probably haven' t been cleaned for years if ever. The staff was friendly in morning and breakfast was ok. We checked-in after 12 AM, so got the key from locker. Nothing special but all you need. They let me check in at 10h instead of 14h which was very very nice and appreciated! Good Value for money, staff was very supportive and helped arranging a cab promptly..
Staff is very helpful and kind. Location is perfect. Building is beautiful and quiet. Room offers basic utilities decently. They had different sizes of cups for tea and coffee. I thought it was great! Nice touch. I would love to say good things about this hotel, but sadly there wasn’t any. Ahmad - the receptionist is a true gentleman, he gave me a clear instruction of sightseeing in the town. With a map marked personally for me I spent half a day and saw everything I wanted. Hotel Pension ARPI This rating is a reflection of how the property compares to the industry standard when it comes to price, facilities and services available. It's based on a self-evaluation by the property. Use this rating to help choose your stay! Hotel Pension ARPI is in Vienna’s district Josefstadt, just over half a mile from Vienna City Hall, and the Laudongasse/Kochgasse Bus and Tram Station is a few walking minutes away, which provides connection to all the major sights of Vienna. Free Wi-Fi access is available. All rooms here feature cable TV. The private bathrooms also have a shower. Extras include a desk and a fan. Several restaurants, supermarkets and shops are in the immediate vicinity of ARPI’s Hotel Pension. Other facilities include a ticket service, a tour desk and luggage storage. An internet cafe with fax and photo copying devices can be found at Hotel Pension ARPI. The bed and breakfast is 1.5 miles from Wien Westbahnhof Train Station, 2 miles from Raimund Theatre and 4.2.5 miles from Schönbrunn Palace. The Wiener Stadthalle Indoor Arena is 2 miles away. Vienna International Airport is a 25-minute drive away. 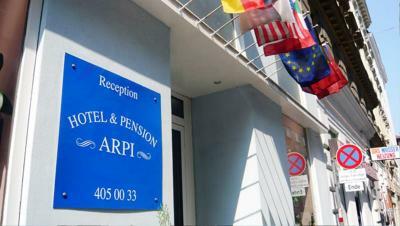 When would you like to stay at Hotel Pension ARPI? These rooms are decorated in shades of red, white and brown. They have a private bathroom, desk and TV. These rooms are decorated in shades of white and brown. They have a private bathroom, desk and TV. These nonsmoking rooms have a bathroom with bathtub or shower and an LCD cable TV. 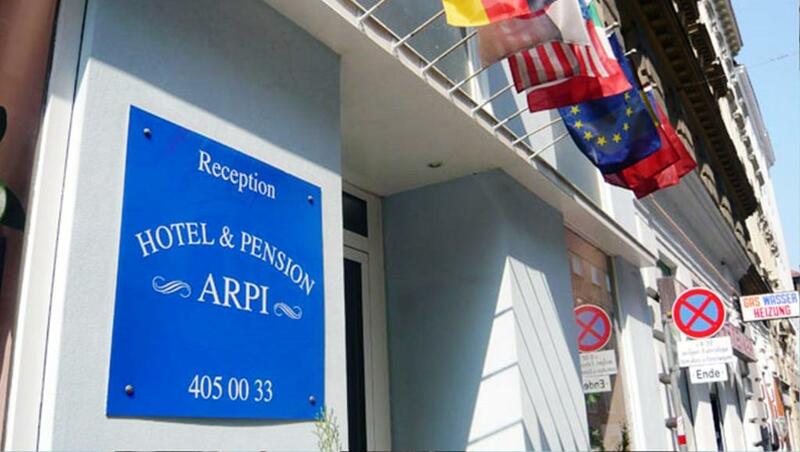 House Rules Hotel Pension ARPI takes special requests – add in the next step! Debit card Hotel Pension ARPI accepts these cards and reserves the right to temporarily hold an amount prior to arrival. Hotel Pension ARPI accepts these cards and reserves the right to temporarily hold an amount prior to arrival. Please note that the reception is open from 07:00 to 21:00. If you arrive outside reception opening hours, you can use the check-in machine. Please contact the property in advance for the password. On request, children up to the age of 2 years and younger can sleep free of charge in existing beds. Older children are charged the full price. The room was quite small but cozy, and everything was so clean. The breakfast was great! It was too hot in the room and during the night the heat was turned off so the room temperature was dropping too much. There was shampoo and shower gel, wifi was working well, the bed was comfortable, the receptionist was nice and the breakfast was delicious. Thank you! The pillow and mattress - the mattress was awful, inclined (!! ), and the pillow was something i had no clue what to do with - so soft that in the end I just crumbled it into a ball. But please check the mattress. I had too poor nights due to it. Also the paperwall was peeling from the walls of the room, and there were cracks on the halls. Breakfast was really good. Also the temperature of the building and rooms was great. The room looked clean but a bit shabby. Nice location - around 20 minutes on foot to Maria-Theresien-Platz, 10 minutes to the closest underground station, make cafes and restaurants around the place. Very good location, kind staff and clean hotel. Not very much to offer besides the room and reception, but what you pay is what you get. Breakfast continental, good. It's really ok for this price. Great value for money, location is great, close to Unibrau. Good connection with 13A bus from Hauptbahnhof. The staffs were very friendly. It was perfect close to everything!thank you for your accomodation!100% recommended! Very hot un the bedroom. We openned the window in Winter!! !